I've just returned from Seattle and Portland Oregon. The best thing waiting for me when I returned from my time away were my boys. I found this picture taken in 2005 at the opening of my "Urban Nocturnes" exhibition at the Carnegie Art Museum in Oxnard. I am not 100% convinced they realize I am an artist, but maybe by the time they are adults, they will believe in me the way I believe in them. 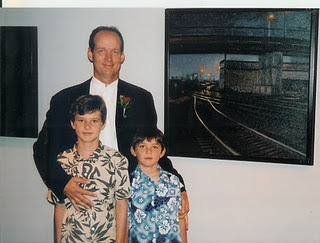 During my career, they have come to many art receptions and art shows which I've been involved with. I see them now creating in their own lives a sacred awareness and appreciation for art. They are both way ahead of me in their art process; further than I was when I was their age. I breath a sigh of relief when I see them "get" the art process, and figure things out on their own. I'm almost ready to let loose the arrow and watch them fly!